SEO copywriting is incredibly important in your online marketing strategy. But even more important is to reach your intended audience. 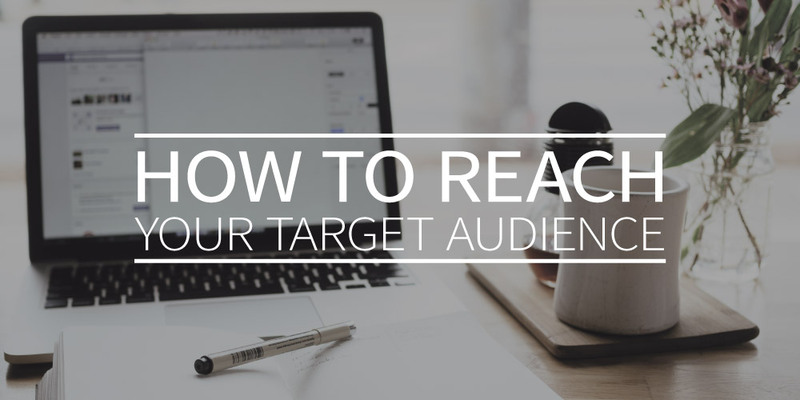 In this blog post, we’ll give you tips and tricks for identifying your target audience, how to segment them, and how to apply this within your strategy. Much too often, we see copy and advertisements that are based on nothing. The key audience gets forgotten, which leads to content that completely misses its mark. When copy is written for no one in particular, it won’t appeal to anyone in particular. These types of content and ads cost time, effort, and money, without any payoff. What a waste. Your online marketing strategy starts with your target audience. When you know exactly who you want to reach, you can apply content optimization, making sure copy and ads are working for you. The more in-depth knowledge you have of your audience, the more precision you can put into your advertising. You’ll start to see higher conversion rates and better ROI statistics! Start by defining the specific group of people you want to reach with your marketing message. This group is interested in your solutions and is very likely willing to purchase your products or services. The more specific you can be, the better. This way, you will discover the very core of your audience — those people who are most likely to lead to conversions after encountering your ad. Start with a broad base and then narrow down your audience in as much detail as possible. Determine who is already using your services or products by taking a closer look at your customer database. Determine the benefits (so not the characteristics!) of your products and services versus those of your competitors. Describe your key demographic: outline who your target audience is and which problem they have that can be solved by your service or product. Test! Conduct an A/B test to discover which advertisement gets the best response from your target audience. This way, you’ll gather even more valuable information about your target audience. Adjust where necessary. Gradually, you will gain even more insight into your key audience. Once you do, adjust your audience description and of course your online marketing strategy. Sometimes a target audience will be considerably small (an expensive Italian menswear brand), other times it will be much larger (a toy store). No matter who your target audience is, you should still break it down into segments within your campaigns so that you can reach people effectively. On Facebook and Instagram it’s quite easy to segment audiences, but in Google Ads things become a little less specific. That’s why it’s important to create content that is geared towards the type of audience you are aiming to reach. It’s possible that you have multiple target audiences. In that case, set up a different campaign per audience, so that you are providing solutions for their diverse needs. Always keep your key audience(s) in mind when you are writing content, photographing products, and filming your business processes. Now that the importance of a target audience is clear, you’re ready to get started. Who is your audience, what are their needs, what is the best way to reach them, and with which content? Once you answer those important questions, you’ll notice that your campaigns become more effective and drive more revenue. Defining and targeting your core audience is the first step towards success! Great content marketing takes serious time and energy, and the cost can also become quite high. That’s why it’s important to keep the return on investment (ROI) as high as possible, so you actually get something in return for all your efforts. That “something” can be, for example, more traffic to your website or increased online sales. 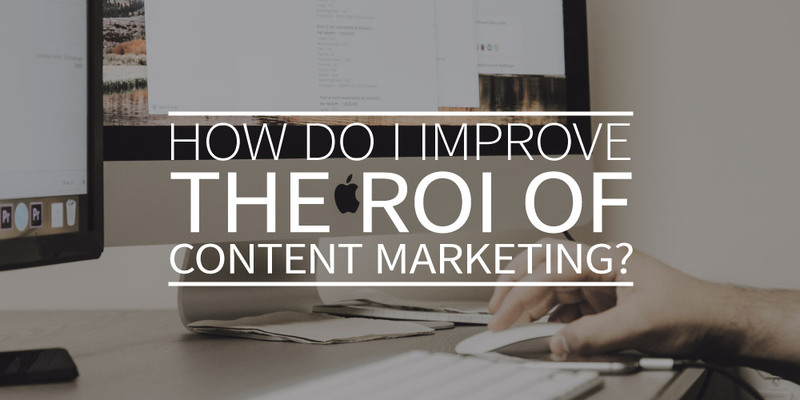 How to improve your ROI, that’s what we’ll dig into in this series of blog posts. Position 0, also known as the featured snippet, is the text box that pops up in a Google search and gives you a direct answer to your search query. Research has shown that position 0 generates a whopping 114% more traffic to a website than position 1. Clearly, it’s well worth the battle! You’ll see the best results by using the right keywords. To help you in that area, you can use Webtexttool Content Ranking. That tool indicates whether you’re on the right track and offers you tips for improved keywords. You might think that position 0 is only available to online giants like Wikipedia. It’s actually also up for grabs for your company or organization, but of course within search queries that are relevant to your business! To improve your chances of reaching this position, you can apply the tips listed below. Use questions to your advantage. It’s smart to use actual questions in your web text, like “How do I rank higher in Google?” and “How can I maximize the ROI of my content marketing?” Then you answer the question very briefly in the intro and expand on your answer in the body of the post. Are you a small business owner? Focus your efforts on local SEO, like “Where can I find a washing machine in Amsterdam?” or “How do I get to the closest café in Victoria?” Make sure to answer those questions briefly, just like in tip 1. Use keywords that already score high in other articles on your website. Not sure which ones those are? Try using the handy Content Ranking Index by webtexttool. Run the Webtexttool Keyword Analysis to link the search queries related to your top keywords. That way you know exactly which searches rank highest in Google, allowing you to adjust your web copy accordingly. Position 0 likes things to the point and strong. The long pieces of web copy you use to explain a product or service won’t score you that ranking. That’s why it’s smart to create separate pieces of content containing about 54 to 58 words in total. Don’t forget about longer blog posts and articles altogether, since Google likes those, too. Make sure you include both styles on your website. Or make sure you have a main question followed by a short summary of a longer post. Columns, tables, rankings, lists… Position 0 loves those! Definitely use them in your content, just like we’ve done here. Make sure your articles and blogs are connected to related questions. Try explaining any jargon specific to your business on a separate page or come up with some questions that are linked to the topic of discussion in your article. Stay alert! Webtexttool’s Content Ranking Index will keep track of how you’re scoring in comparison to your competitors. That way you know exactly when it’s time to take action. Automation of SEO. Webtexttool offers the plug-in ‘SEO-editor’, which you can apply to your website (compatible with WordPress, Drupal, Joomla, SiteCore, and Word). It automatically ensures that your content is made Google-proof. Easy peasy, right? By applying the tips listed above, you’ll improve your chances of conquering position 0 in Google. But that can only work if your SEO basics are in place. Check to make sure that your website is completely optimized before even thinking of position 0. Make things easy on yourself, though, by using our Content Creation Engine and the Webtexttool Content Ranking. These smart tools make it much easier and a lot more fun to write great, discoverable, and Google-friendly content. Need more help than that? In this blog you’ll find more information. Would you like to dig a bit deeper into SEO and how to best apply it to your website? You could, of course, dig through thousands of whitepapers about SEO, all available online. But if you lack the time and desire to do that, you can simply use the Content Creation Engine by Webtexttool. Just start writing, and our tool offers you tips to update your SEO along the way. Our team is always up-to-date, does take the time to read all the thousands of SEO whitepapers, and then integrates all that information into the Content Creation Engine. That way you can create great content quickly, without having to hit the books first. You can even have it check your “older” content. Copy and paste the existing copy into our tool to get advice about SEO. The tool will check the text against the latest rules and guidelines for Google and offer advice on that front. Implement the points of improvement, then paste the optimized text back into your website. It’s practically child’s play! Would you still like to immerse yourself in the wonderful world of SEO? We wouldn’t recommend sifting through all the SEO whitepapers out there. Online, you’ll often run into information that’s no longer relevant, which is such a waste of your time. Thankfully, there are many whitepapers that are worth your while. Which ones? Find out in our very own blog about whitepapers. And we take things a step further in our blog post about technical SEO and content marketing. 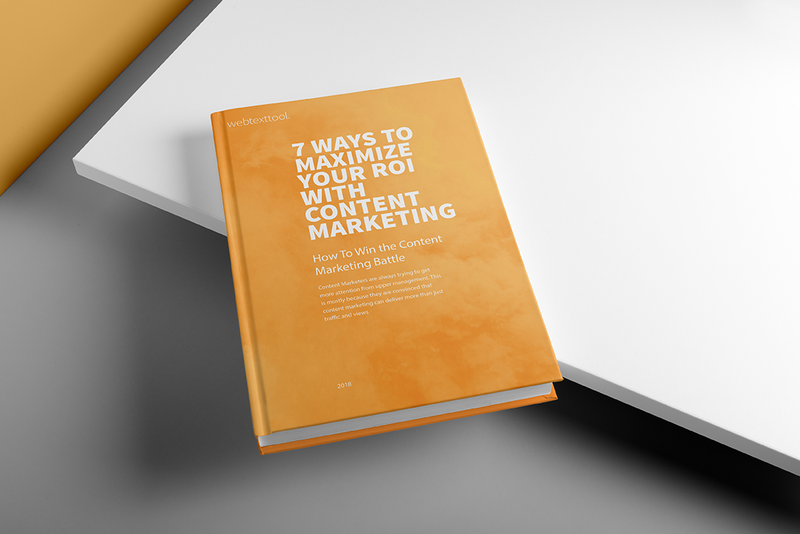 And while we already have you reading, this is where you can download our book ‘7 Ways to Maximize Your ROI with Content Marketing’. The e-book offers a short and practical summary of our blog posts that cover all the ways to get more out of your investment in content marketing. 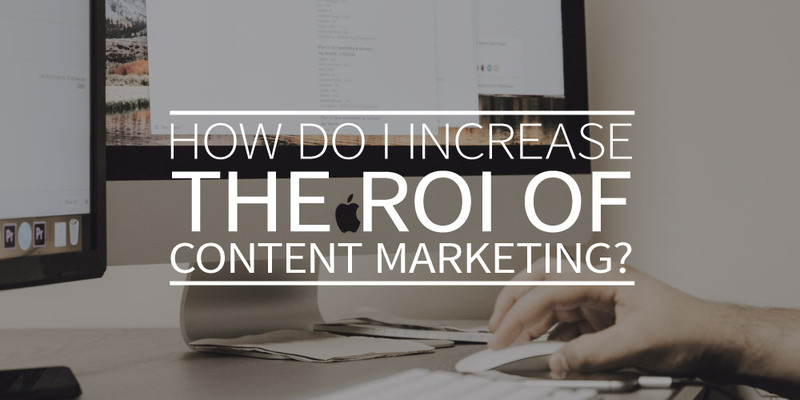 Do you want to improve the return on investment (ROI) of your content marketing efforts? Of course, you do! Your content took blood, sweat, and tears to create, so you want to see something in return. Ideally in the shape of higher traffic, more engagement from your target audience, and revenue growth. That’s why webtexttool is gladly offering you this blog series full of tips and tricks to maximize your ROI. Make sure you stay up to date on the latest developments in regards to search. Text search isn’t the only factor to take into consideration nowadays. Voice search is a quickly growing trend that will only gain more importance over time. Especially the younger generation enjoys asking Siri and other voice assistants questions like “where can I find a local painter?” or more trivial questions like “how much milk does a cow produce?”. In the past few years, the number of spoken search queries has increased by 20%, and that number is projected to double in the coming years. Typing out a query takes more time and effort than simply asking Siri or any other voice assistant a simple question. That means your content needs to cater to that behavior. One way to do that is by using long-tail keywords. A text search usually contains fewer words than a voice search. Don’t be afraid to integrate casual language into your SEO. The way we speak is generally less polished than the way we type. Of course, any written content for voice search should still prioritize relevance and readability, just like standard web copy would. Ultimately, you’re not writing content for search engines, but for your readers. A clearly organized FAQ page on your website can also contribute to a high ranking in voice search. That’s where you quite literally include questions and answers that align with the grammatical structure of a voice search. For example, the question might be “what is webtexttool”, and the answer is “webtexttool is an online tool that helps you create easy-to-find content with great conversion rates”. Keep in mind that your content should be mobile-friendly. Or rather the website that your content is presented on. Nowadays we are much more likely to use our smartphone for a search query than we would take the time to run to a computer. Data from Google shows that over 60% of all searches are done on a mobile phone! So make sure your website is prepared! The basis is a website with a quick loading speed. You could try installing Google Accelerated Mobile Pages to help with that. And create content that is easy to scan by using eye-catching subheaders and bullet points for clarity. Evergreen content is the kind of content that will always be relevant to your readers, without having to update it frequently. Green and sustainable! Additionally, this “green content” will be the source of traffic for years, without the added workload. That’s why evergreen content is such an important element in your content marketing strategy. How-to manuals. Those are always up to date, and people are always looking for easy instructions. For example, think about a tutorial for a Christmas centerpiece or tips on how to remove those awful wasps from your back yard. FAQ. A list of frequently asked questions plus answers. Product reviews. Ratings and reviews stay up to date unless products get replaced by alternatives or newer versions. A list of jargon and technical terms with an explanation of each one. Evergreen content becomes even more powerful when you combine it with Search Engine Optimization (SEO). When you incorporate the right keywords in your content, it becomes more relevant and, as such, easier to discover in search engines. A wonderful result is more traffic to your website and a greater chance that your content will be shared for months (or even years)! In an earlier blog post, we delve even deeper into evergreen content. The trends we listed above are step two in the improved ROI of your content marketing. Trends and tools in the field of content are always developing and improving. If you don’t integrate those into your website and use them for your content marketing, you’ll always be one step behind. So make sure you stay up to date. Taking care of your own content marketing? Webtexttool will gladly share our knowledge and skills with you. Put our Content Creation Engine and the Webtexttool Content Ranking to good use. These tools make it a whole lot easier to write great, discoverable, and Google-friendly blog content. 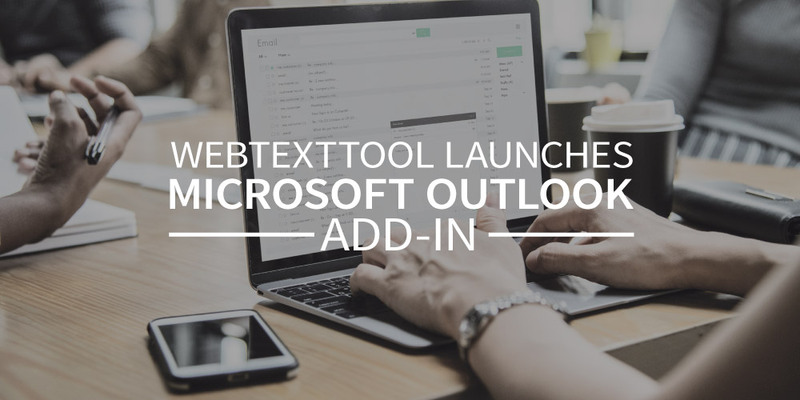 With our new Outlook add-in our content quality suggestions are now directly integrated in Outlook. It will enable you to write better emails that actually match your target audience in terms of readability (“B1 level”), tone of voice, sentiment, company communication style guides etc. Webtexttool is the content creation and content performance monitoring platform that enables you to create content specifically for your target audience. The aim of Webtexttool is to make sure your content is found better and converts better. With Webtexttool you can make sure your content is SEO friendly and matches your target audience in terms of readability (B1 level), tone of voice, sentiment and several other important aspects. Resulting in more traffic and higher conversion on your site. Webtexttool has several other plugins available for popular CMS’s like ao. WordPress, Drupal, Joomla, Sitecore, Craft, Umbraco and also for Microsoft Word and Outlook. More information can be found on the webtexttool plugins page. We are excited to announce that the Webtexttool plugin for Umbraco CMS is now available for download! The plugin enables Umbraco CMS users to use the Webtexttool content analysis and optimization services directly in their Umbraco CMS. There is no need to go from one platform to another. Just download and add the plugin in Umbraco CMS. The plugin will give you optimization suggestions to improve the quality of your content and make sure it’s SEO friendly as well.